DJI have released the latest drone in their Phantom series, the Phantom 4 Pro+ Obsidian. The Obsidian gives the Phantom 4 Pro+ a new and iconic design whilst keeping the proven qualities to make it the most popular quadcopter on the market. The shell of the aircraft and remote controller have been given a sleek, matte-gray finish with anti-fingerprint on the aircraft's gimbal. 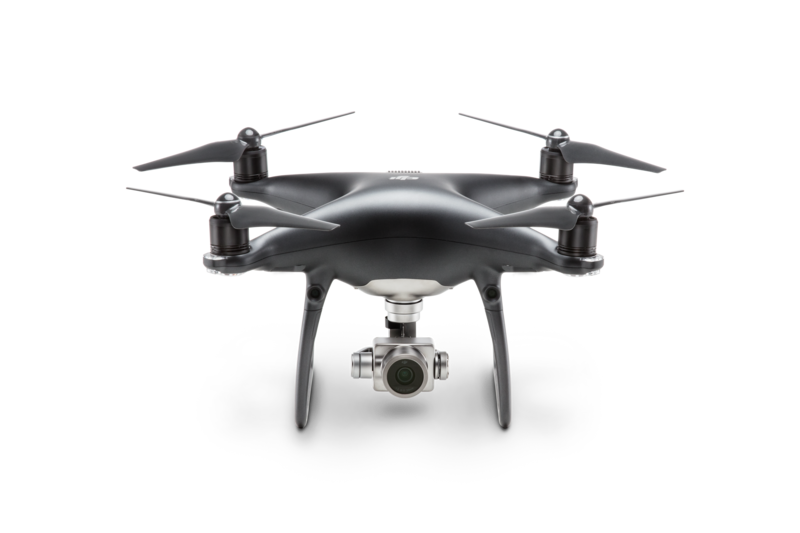 The Obsidian maintains the trusted specification of the Phantom 4 Pro+ and delivers professional quality images for pilots. The Obsidian has a 1-inch camera capable of taking images at 20-megapixels, and video in 4K at 60 fps. The Burst Mode on the Obsidian can also capture stills at 14 fps. The Obsidian's technology has eliminated shutter distortion with its mechanical shutter and an eight-element lens gives the high-quality images all of the time. The Phantom 4 Pro+ Obsidian's remote controller comes with an amazing built in screen with a 1,000nit display that can be used in even bright conditions. The Obsidian gives safe flight with its 5-direction obstacle sensing and 4-direction obstacle avoidance. The FlightAutonomy is possible due to front and rear vision sensors in the front and rear and left and right infrared. The Obsidian's 15.2V 5870 mAh Intelligent Flight Battery gives a flight time of up to 30 minutes, plenty of time to capture the images you need. A range of 4.3 miles (7km) can also be achieved. The Phantom 4 Pro Obsidian is packed full of DJI’s Intelligent Flight Modes. Draw – allows you to gain complex shots by creating an automated route on screen. ActiveTrack – follow and capture a subject while they move. TapFly – tap your screen for the Obsidian to fly safely in a specified direction. Gesture Mode – gesture at your quadcopter to take selfies. Whether it's extra flight with more batteries, or better shots with the range of filters available, the range of accessories on offer for the DJI Phantom 4 Pro Plus Obsidian makes it an extremely flexible tool for both photography and videography.